Congratulations to Patrick and Crosby for a safe return home! 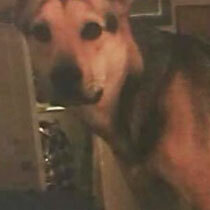 Crosby is a four year old shepherd mix who was being walked by a pet sitter when he escaped. He had his leash attached and when the pet sitter tripped and lost control of the leash, he bolted. K9 Jake was able to show the exact area where Crosby was circling. Crosby was seen two days by his owner. When Crosby saw him, he ran right up to him! What a joyful reunion! Crosby missed Patrick almost as much as Patrick missed him.